1 sachet or 1 teaspoon coffee melt into one spoon hot water and added with cold milk. Add flour, sugar, cocoa, baking powder, baking soda, salt to a large bowl or the bowl of a stand mixer. Now put the butter, sugar, vanilla extract into the mixer, then whisk it in medium speed until the sugar mix well, add the egg white one at a time and turn the mixer to high speed, until you finished putting all the egg whites,( leave the egg yolks for later) and when its fluffy, we will now add the flour mixture gradually, while turning the mixing to low speed, add the milk or the coffee to get the right texture. if not enough just add a bit of whole milk. Spread the mixture to the tin and cook for about 40-45 minutes or stick a toothpick, when it comes out clean, its cook! Remove from the oven and cool down it to the rock. NOW while cooling down our cake we will now make our fillings by putting a cooking pan into the gas stove, put all the black forest fruits, add sugar, and vanilla extract and cook it for 5 minutes. Drain the fruits, separate the liquid from the fruits. Use about a cup of the syrup and put into the mixing bowl, add 1 cups of icing sugar to make sweetness then add the 400 double cream and whisk it until turns into fluffy and in the right whip texture. Fridge it. Used another 400 ml. whip cream, now just add 1 cup icing sugar for sweetness and whip-fridge it. 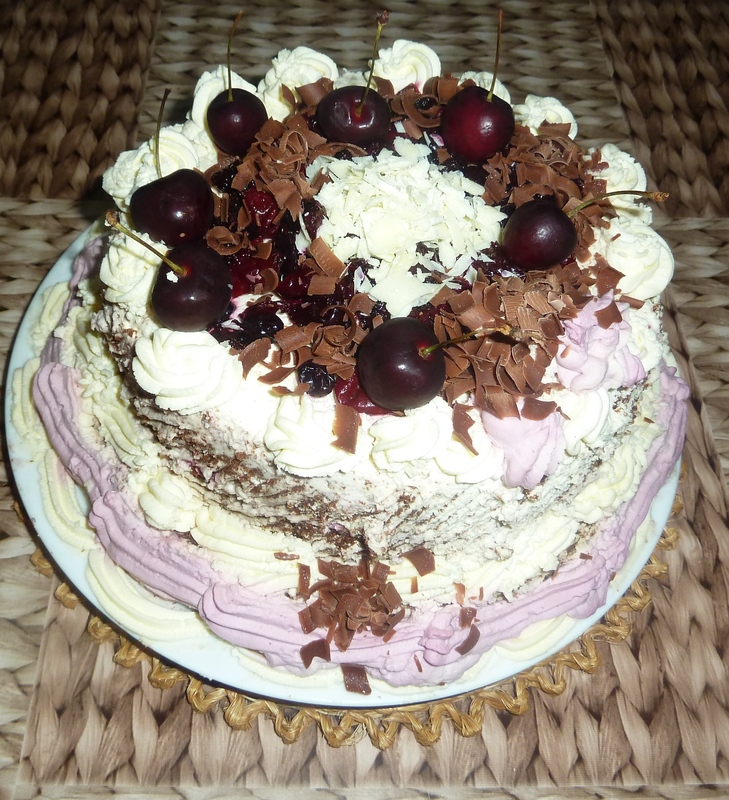 When our cake is ready and cold, sprinkle or put the black forest syrup equally, this will moist the cake, but be careful now to make the cake so wet, just make it moist. Target the bottom part. 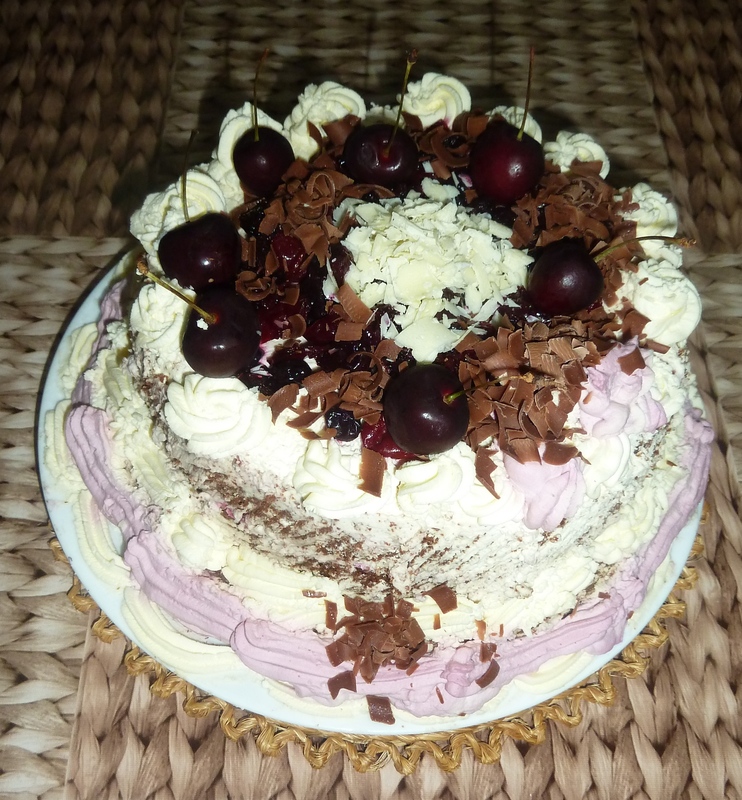 Then spread the cream and design your cake with the whip cream, with chocolates on tops, and cherry fruits. See pictures attached.